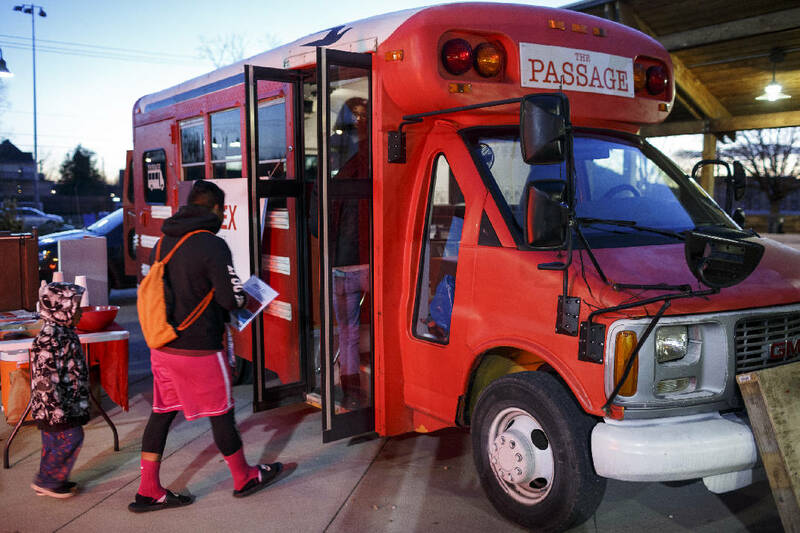 Visitors enter the Passage bus at a stop for UnifiEd's Action Plan for Educational Excellence at the Highland Park Commons on Wednesday, Dec. 13, 2017, in Chattanooga, Tenn. The project committee for APEX plans to travel Hamilton County in a transformed school bus to seek public opinion about ways to solve inequities in the public school system. A nonprofit organization working to improve and champion Hamilton County public schools has launched a communitywide bus tour to collect public opinion about ways to address existing inequities in schools, and organizers hope it will add fuel to a growing grassroots movement. Between now and Dec. 21 and between Jan. 15 and Jan. 21, UnifiEd staff and members of their Action Plan for Educational Excellence, or APEX, project steering committee plan to travel around Hamilton County in an old school bus transformed into a meeting space. They will set up at grocery stores, shopping centers, churches and schools, said Ashley Conrad, director of policy and research at UnifiEd. "This won't be a pre-planning meeting that attracts the same kind of people again and again," Conrad said. 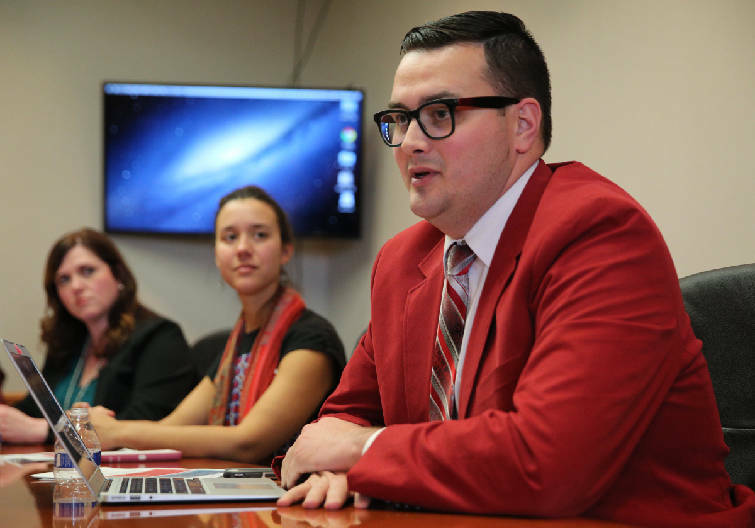 "We want to represent the whole county and be intentional about how to get all those voices. We want to get people who aren't usually included or people who think that they don't have the skills to participate. We want this to be easy to access." Jonas Barriere, executive director at UnifiEd, speaks during an interview at the Chattanooga Times Free Press Tuesday, Dec. 12, 2017 in Chattanooga, Tenn. The research and policy team for UnifiEd shared data results from the APEX Project survey. Natalie Cook, communications director at UnifiEd, speaks during an interview at the Chattanooga Times Free Press Tuesday, Dec. 12, 2017 in Chattanooga, Tenn. The research and policy team for UnifiEd shared data results from the APEX Project survey. Those who wander onto the bus, which will be in a different location each morning and evening during the tour, will find hot drinks and good conversation, Conrad said. But they also will be encouraged to weigh in on the big question posed by the APEX project: How can schools be more equitable? Between August and November, UnifiEd collected surveys that asked community members to identity inequities that exist in Hamilton County schools and pose solutions to them. More than 2,600 surveys were completed and input into a qualitative analysis software program, said Natalie Cook, communications director for UnifiEd. Then a team of researchers teased out the top 25 themes from all the information gathered. On the bus, each visitor will be given seven chips and asked to cast their seven votes for the statements on the list that they identify with the most. At the end of the process, those working with the APEX project hope to have a community-written policy platform that can be presented to the community, the Hamilton County Schools system and the elected officials who fund it. They also hope the grassroots work will help educate the public on what equity is. Once all the bus tour votes are tallied, the final themes determined by the community will be paired with best-practice research done by UnifiEd staff and the APEX steering committee. A policy platform will be released by February. "We are learning from the community," Conrad said. "But hopefully they are getting some understanding from us as well." 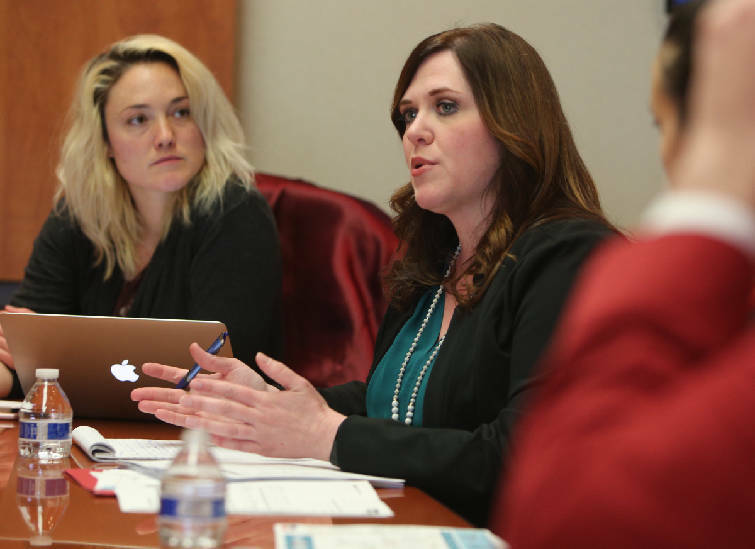 UnifiEd's APEX project was launched in August to facilitate tough conversations and encourage the community to get honest about the school system, said Alexa LeBoeuf, director of community outreach and design at UnifiEd. Their first step was putting together one of the most diverse steering committees in the city. More than 100 people applied, and three people were selected from each county commission district in a blind application process to total 27 steering committee members. To ensure all those selected could participate, UnifiEd provided stipends to cover child care costs, lost time at work and transportation. UnifiEd staff wanted to level the playing field and remove the structural barriers that prevent engagement, LeBoeuf said. "The process of APEX, for us, is as important as the final policy platform," she added. "A really big outcome is faces at the table that haven't been at the table before." The experience has been transformational, said Steve Slater, a Soddy-Daisy resident who sits on the APEX steering committee. Slater attended Hamilton County schools. So did his children and now his grandchildren, and he said he got involved because "it is pretty common knowledge that the Hamilton County school system isn't the best around." He likes the approach of APEX, he said, because it is empowering everyday people and genuinely wants public opinion. Finding solutions to the inequities that plague the public school system is going to take a chorus of ideas and voices, he said. "I am probably as conservative as a conservative can be," Slater said. "But if everyone had my view it would be pretty sad. You have to have different views." Solutions also will require people with a variety of ideas, backgrounds and experiences come together for a common good, he added. "It doesn't matter if you are Democrat, Republican or independent, our concerns are the same," he said. Until becoming involved in APEX, Slater said he, like many, was opposed to the idea of increasing funding for education. "I was always like, oh, they work nine months a year, big deal," he said. Now, after talking with many teachers and school officials, Slater thinks very differently. "I have learned that they [teachers] work hard, extremely hard, and I think we should pay them more," he said. "I am willing to pay more taxes." This story was updated Dec. 13, 2017, at 11:59 p.m.